Barrel-aging beer is nothing new at this point. Whether it’s bourbon and whiskey barrels, or even wine barrels, it seems that at this point most breweries have dabbled in the process. Alcohol-infused oak lends new layers of complexity to the beer that’s being aged. Bourbon will impart lots of vanilla and rich boozy-soaked wood, while wine barrels add a delicious tannic and vinous flavour to the beer. That said, what about fortified beer? Adding actual spirits to a beer? This is something that I have never came across before. How would that transform the flavour profile? 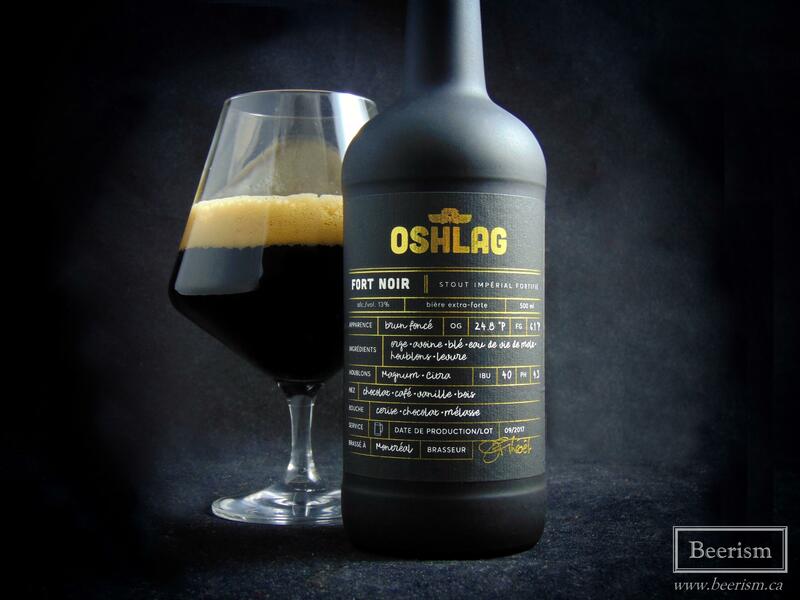 That’s why when I saw Oshlag Brasserie & Distillery release a whiskey-fortified imperial stout called “Fort Noir,” my interest was immediately sparked. I reached out to Oshlag and procured a sample so that I could tell you all about it. 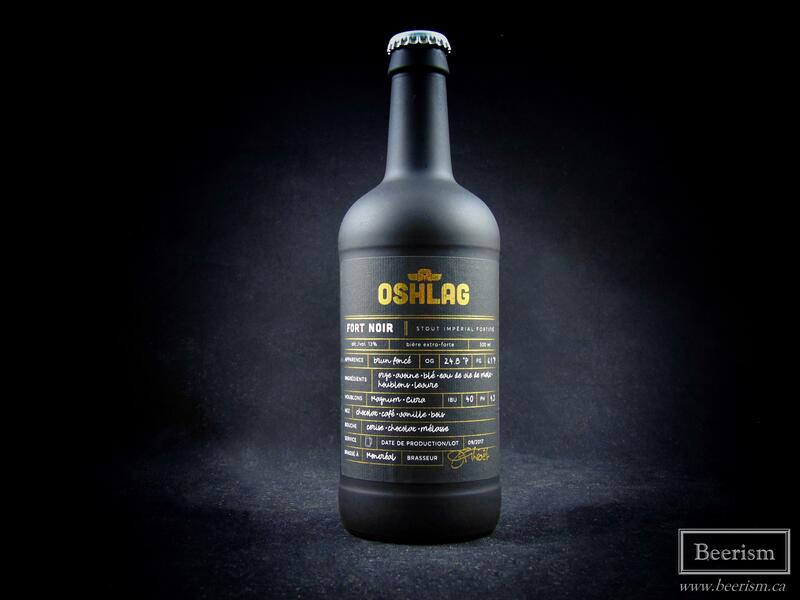 Oshlag is located in the Hoshelaga-Maisonneuve district of downtown Montreal, where they both produce beer and spirits. 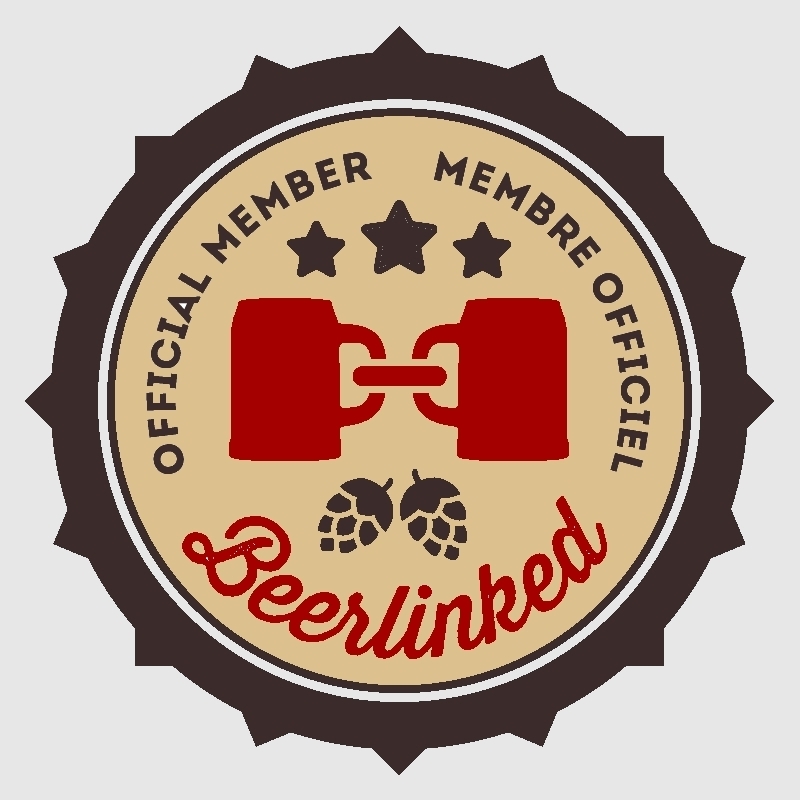 As well, they own sister companies Glutenberg and Transbroue, not to mention brewing beer for contract breweries like Microbrasserie Vox Populi and Avant-Garde Artisans Brasseurs. I’ve only had a few of their offerings, but everything that I’ve tried, I have enjoyed quite a lot. They have also worked with the fantastic blogging duo, Les Coureurs de Boires, to create some interested and delicious creations. 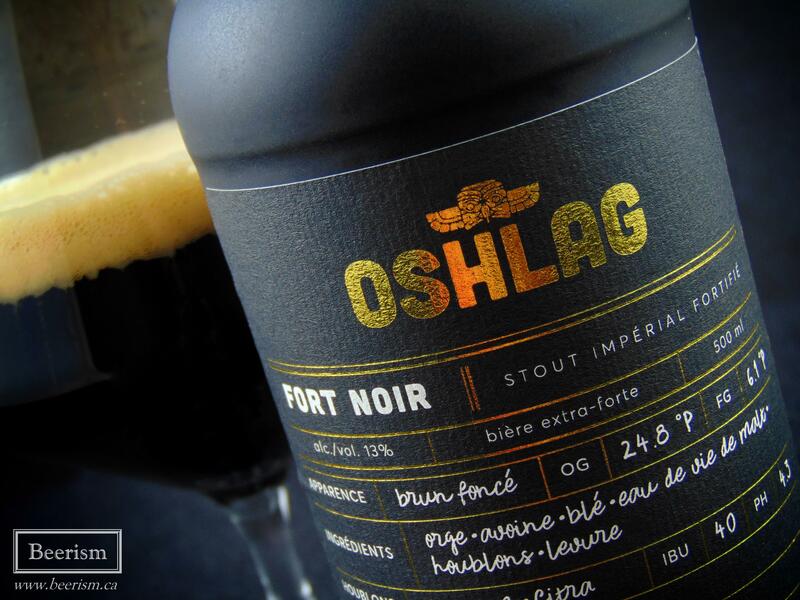 As I mentioned, Fort Noir is a 13% Imperial Stout, fortified with Oshlag’s in-house whiskey. I’m very curious what this is going to be like. It pours out thick and jet black, with a wonderful motor oil look to it. The head puffed up and quickly died down, leaving a small foamy layer to rest atop this luscious liquid. The nose is sharp, with some solvent-like characteristics – clearly showcasing the whiskey and high alcohol content. Extremely dark chocolate is very present, alongside some serious black cherry fruitiness. There are hints of dark roasted coffee and some whiskey notes, but not the usual accompanying oaked vanilla complexity that one would get from barrel-aging. Instead, it’s more linear, while less rich and layered. The body is huge and luscious, with a perfect creaminess to carbonation ratio. It is boozy and sharp for sure, but instead of masking this with over the top sweetness, they manage to make this beer balanced and quite drinkable given the 13% ABV. The “stout” profile is more restrained than your usual imperial stout, with chocolat and coffee layers that are more on the fruity side. It carries hints of acidity to create a black cherry presence, instead of a nutty, or milk chocolate-like roast profile. The finish is extremely long, with a sharp whiskey linger, alongside an ample bitterness that cuts through any malt sweetness. Overall this is good. I like how sharp and intense it is, while still being highly drinkable. That said, the solvent-rich elements are intense, a touch astringent, and take away from the general stout profile a bit. The fruity layers do however add a nice compliment to everything, and overall there are nuanced flavours and several delicious layers to sit back and ponder over – especially for the cold days to come. I recommend this beer if you enjoy beers like Mikkeller Black (although this is far more balanced), or if you’re into very high ABV beers in general. That said, don’t expect that barrel-aged mocha vanilla bomb that something like BCBS or KBS would give you. This is a completely different beast – a beast that I enjoyed. This beer is only available through private order. If you are interested, you can send an email to importationprivee@transbroue.com with your name, address, postal code and phone number.